We are teaming up with ArtAboveReality to bring Cornbread, the godfather of graffiti, for his first solo exhibition in Los Angeles, at Gallery 38, with a slew of VIP programming slated around the exhibit retrospective which will feature original works, a Graffiti Art Tour with Cartwheel Art Tours, hosted by Cornbread and Steve Grody and a very special Art Talk hosted by Street Art Professor Jim Daichendt. Born 1953 in North Philadelphia as Daryl McCray, Cornbread used his troubled neighborhood and precocious personality as springboards to become the youngest artist to stir a worldwide movement: graffiti. Cornbread’s unflinching desire for recognition motivated him to utilize graffiti as expression. In contrast to tagging’s prior use as marking specific territory, Cornbread wrote his name all over Philadelphia to showcase no one neighborhood is enough for an artist. Featuring collaborations with Moncho 1929, Jeff Hamilton, Lucas Raynaud, Johnny Brushstrokes, Oogum Leftfoot. Street Art Tour of LA Street Art and the History of its evolution. This series addresses timely questions in street art, from the current creative landscape to its early beginnings. Hosted by The Professor of Street Art, Jim Daichendt and in conversation with Cornbread. It began with writing on school walls to grab a girl’s attention and grew into marking an elephant at the Philadelphia Zoo and the Jackson 5 airplane to earn national fame. From there, Cornbread’s influence spread everywhere, inspiring artists from LA to Berlin. Los Angeles is now a force on the graffiti scene yet it has never hosted an exhibition focused on the original master of the craft. Gallery 38 gives the legend his due, including bringing the artist himself out to be at the center of it all. 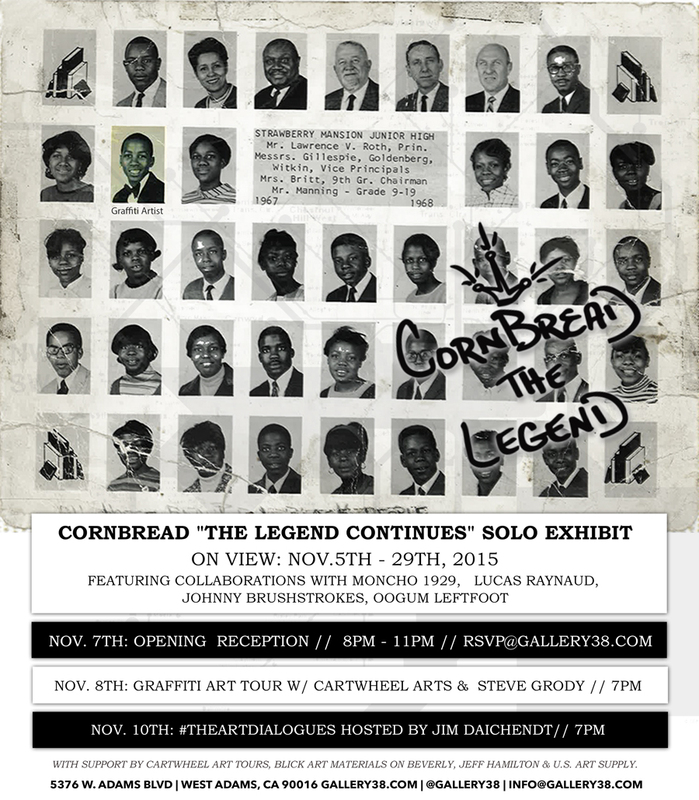 Cornbread “Legend” features a gallery full of his work and a selection of activities to celebrate his life and graffiti as an art form. The itinerary includes art talks, graffiti tours, and live collaborations. Please contact press@gallery38.com with any press inquiries. With support by Cartwheel Art Tours, Blick Art Materials on Beverly, Jeff Hamilton, STREET, U.S. Art Supply.